Liponox is a diet pill that promises to pump up the consumer with massive energy and serious fat burner ingredients. Allegedly, this product has been in research and development for 2 years and is now finally available for review. But does Liponox really work? Our team of nutrition researchers spend hours a day combing the weight loss supplements world for new and exciting products to review based off of three main criteria: 1) scientific and or clinical backing, 2) the company from where the product originates, and 3) what the customers themselves are saying about it. So let’s take a closer look at Liponox. 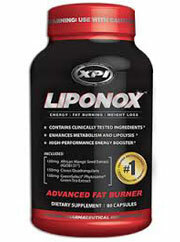 Liponox is a weight loss product brought to you by XPI Supplements LLC, a company based out of Utah. Right off the bat, the available product information is a bit confusing as there are conflicting reports - some sources claiming there are 107 ingredients in Liponox while others say there are only 13. This, however, is most likely due to a recent rebranding that Liponox underwent and as a result there is plenty of old and new data floating around the internet space currently. But aside from this confusion, XPI Supplements LLC does have a professional website and easy-to-understand information therein. However, the first major red flag came in the way of a lack of company contact information, such as a physical address for example. This does not bode well considering the company would already appear to be elusive and the fact that they’ve rebranded their products makes us suspicious. So what’s inside of Liponox? Our team uncovered that the current Liponox contains much smaller amount of ingredients than the previous version: Cissus Quadrangularis (150 milligrams), and Phytosome Green Tea (150 milligrams), in addition to a 565 milligram proprietary blend. However, as it goes with proprietary blends - the company is not required to release the exact specification of what quantities they put inside of their proprietary blends, only that it contains about 13 additional ingredients including green tea extract, guarana, green coffee bean extract, yerba mate, black tea, etc. etc. Although our team cannot say exactly how much of each ingredient is inside of this proprietary blend, we can say that it seems to be filled with caffeine-laden ingredients and should be approached with caution by people sensitive to stimulants. But aside from the obvious effects of ingesting lots of caffeine (hunger control, increased alertness, thermogenesis) it seems the other ingredients, such as Cissus Quadrangularis for example, are still largely unproven. Although the Liponox website claims that Cissus Quadrangularis is proven effective - with impressive eye-catching graphs to boot - a quick look into WebMD proves quite the opposite, citing entirely insufficient evidence as to whether Cissus Quadrangularis may reduce weight or not. Moreover, this ingredient may lower blood sugar and should be taken with caution by those who suffer from diabetes, according to WebMD. Of course this is exactly the opposite of what WebMD claims (a far more reputable website) and given this information, it seems Liponox is essentially just saying what customers may want to hear. Insofar as customer reviews are concerned, the most common complaints have to do with upset stomach, headache, anxiety, and jitteriness - all most probably a result of the product’s heavy inclusion of caffeine. Given all of the facts combined - elusive company, rebranded product, misleading information, undisclosed ingredient proportions - we simply cannot recommend this product and customers should be quite wary of it. In our recommendation, the consumer should go with a product that provides proper contact details, exact specifications of ingredient proportions, and accurate information. Sadly, Liponox does not deliver on any of this. Bottom Line: Liponox is a product worthy of intense scrutiny seeing as there are just too many uncertainties, inconsistencies, and even blatant moments where the facts say one thing and the product another - do proceed with caution.